Maybe your hedges are growing and it’s time for you to shape them up, or maybe it’s time for your annual winter or spring trimming. Either way, nothing will help you more than a good pair of hedge shears. Hedge shears don’t sound that complex, but there’s actually a lot of variation among products. We’ve taken all the best ones, broken them down into categories, and given our review so that you can know which ones are the best hedge shears for you. Let’s get started with our top overall pick. Fiskars’s hedge shears take our best overall pick because they are loaded with features, come with a lifetime guarantee, and are a great fit for a budget buy. One blade on this hedge shear is serrated and the other blade is not serrated. The serrated side is a nice perk because it helps to grab the branch or limb while the other, sharper side cuts through it. The Fiskars also comes with a power lever mechanism that should make cutting a good bit easier for you. Another perk of this shear is that Fiskars has patented technology to make it where the blade sharpens itself during use. Since an occasional sharpening is the most maintenance required on the majority of hedge shears, Fiskars makes it where your shear upkeep will be right at an annual average of zero hours. 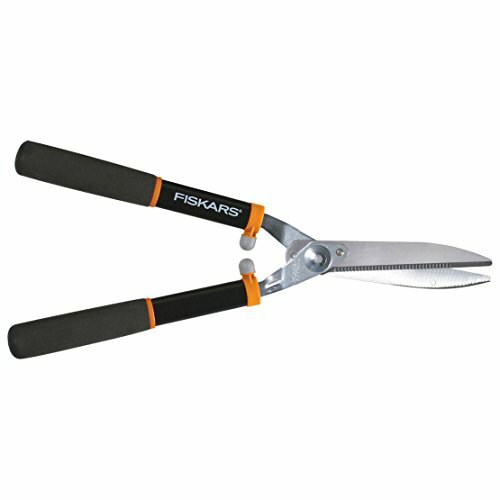 The Fiskars comes with padded handles and a shock absorption feature so that you’ll never have to worry about bumping your knuckles or smacking your hands together while trimming your hedges. This may not be a deal breaker, but every ounce of extra comfort is a good thing. Like the majority of Fiskars products, these hedge shears come with a lifetime warranty, so you can trust that they will be able to endure the toughest of hedges. The Fiskars hedge shears are a good option for those who don’t have any specific requirements (for example, if you don’t want Japanese wooden handles) and for those who like to know that their product comes with a lot of security. These are a great overall buy and come with a lifetime warranty. TABOR TOOLS B212A Extendable Hedge Shears for Trimming Borders, Boxwood, and Bushes. Telescopic 25"+ 8" Hedge Clippers with Wavy Blade and Long Telescoping Power-Lever Steel Handles. Tabor Tools has produced a tool with a feature that makes a ton of sense in hindsight, but a feature that no other competitor has. We selected Tabor Tools as our top pick for tall (or otherwise hard to reach) hedges because this hedge shear comes with a telescopic handle that can be extended. If you’ve ever seen a pirate movie where the pirate takes our his or her looking glass and extends it, that is an example of the same telescopic handle that these hedge shears are equipped with. When these hedge shears are not extended, their full length measures out to 25″. Extended, they can reach all the way to 33″. That 33″ is far longer than almost any other pair of hedge shears on the market today. Not only are these shears capable of reaching further than their competitors, but they are comfortable too. They come with padded, non-slip handles to help you maintain your grip with shock absorbers so you won’t be smacking your hands together. The Tabor Tools will allow you to adjust your blade tension as well, so you can adjust and make it a bit easier for yourself if you’re going through thicker ferns, shrubs, or hedges. The tension adjustment won’t turn you into a hedge-shearer of superhero strength, but it does make things a little bit easier. This shear doesn’t come with a warranty and is a bit weighty at 3.3 pounds. The Tabor Tools shear is the best option if you have always struggled to reach high or other hard-to-snip places on your hedges. The Okatsune shears are the best option for you if you’ve ever dreamed of being a samurai, or if you have thick, bushier-than-normal hedges. These shears are made of hammer-forged Izumo Yasuki Steel, which is the same steel used to make Japanese swords. 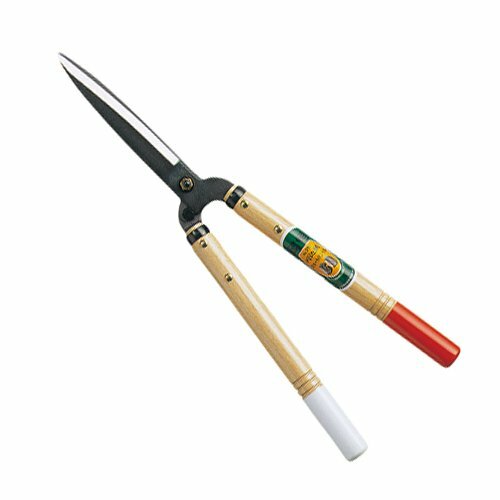 These shears are literally made from the same material that samurai used and the quality of the workmanship shows: the Okatsune shears chop through the thicket of foliage and snip the foliage rather than breaking it. The difference between snipping and breaking the foliage sounds small, but it can make a big difference if you’re going for a very professional look. 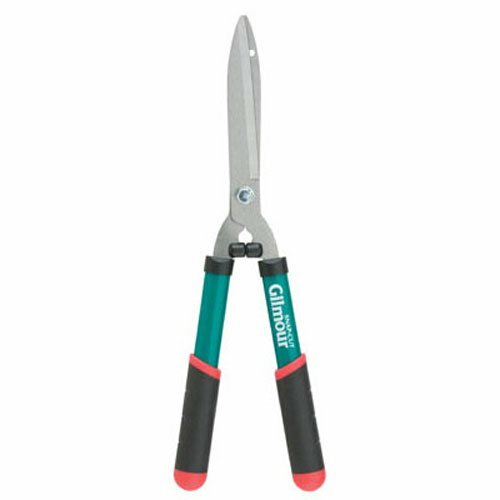 These shears are very sharp and have no problems cutting through hedges that are on the thicker end of the spectrum. Okatsune’s shears have Japanese white oak handles, but the handles don’t come with a lot of comfort features. There are no comfort handles and you won’t get any shock absorption. An upside to the handles is that they are separated far enough apart that your hands don’t run the risk of touching or smacking into one another. Another feature of these shears is that they are light – very light. If the shears weren’t so sharp, they could be mistaken for something made by Fisher-Price. The Okatsune shears weigh in at a grand total of 1.3 pounds, so they are a good option if you’re looking for something that won’t wear out your arms and shoulders. 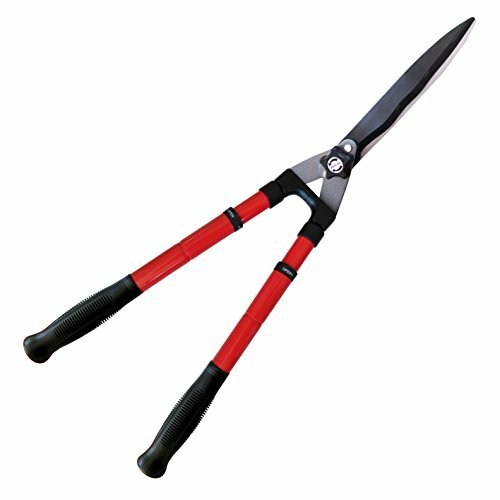 These shears are our recommended option if you have thicker foliage or want a more professional cut. We can also confirm that you will feel like an ancient Japanese warrior while pruning your hedges. 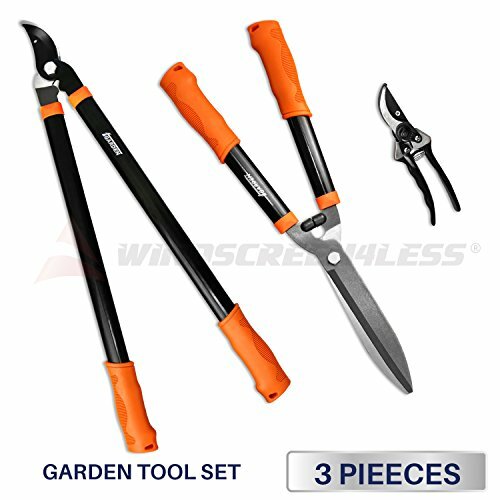 3 Piece Combo Garden Tool Set includes Lopper and Hedge Shear and Soft grip Bypass Pruner. This 3 piece set is made with high carbon steel blades and comfort grip rubber handles. For smooth, easy cuts on tree branches, comfortable use and lasting value. A fully hardened, precision-ground steel blade stays sharp, and a rust-resistant, low-friction coating makes every cut even easier. iGarden’s 3 piece combo set comes with a pair of hedge shears, limb loppers, and pruner shears. This is what we recommend you get if you’re looking for a more complete yard care solution. Even without the loppers and pruner shears, the hedge shears alone come at a pretty good value: the blade is high-grade carbon steel, rust-resistant, and comes with a low-friction coating to make cutting even easier. 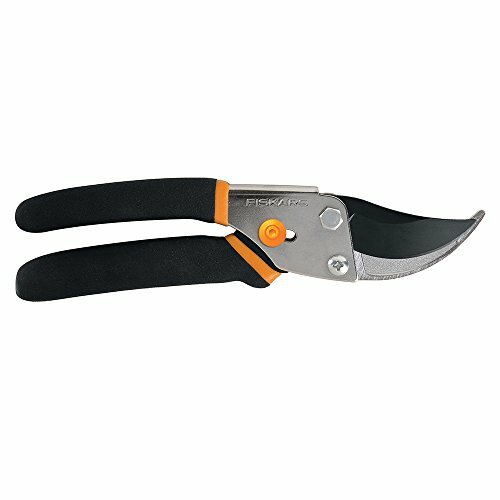 The blades on the loppers and pruning shears are also stainless steel, rust-resistant, and have a low-friction coating. The handles have a comfort grip on each piece in this set and are shock-resistant in the loppers and the hedge trimmers, so you don’t need to worry about your hands smacking into each other. The real value of this package is that you will be getting 3 items for less than you can purchase hedge trimmers alone from some companies. The hedge shears, loppers, and pruner shears all complement each other well; the hedge shears can be used to shape up your hedges the way you like, the loppers can cut through larger-than-normal branches, and the pruner shears can help you to get the exact look you’re going for. Even though all three items are great standalone pieces, none of them have any true distinguishing features. This is a good option for anyone who needs a more complete package. All in all, the iGarden 3 piece combo will best serve someone who doesn’t have many tools to take care of the hedges, has thicker-than-normal hedges, or is very particular about a certain look and would like a smaller, specialized item like pruning shears. Gilmour’s hedge shears offer a lot of features at a price point that other competitors just have trouble keeping up with. If you go with the Gilmour shears, you’ll first notice that the blades are different from each other. One blade is straight and sharp while the other blade is notched and serrated. These straight, sharp and notched, serrated blades help you to grab and cut through the branches on your hedges better than blades that are just straight. The handles on these shears are high quality as well: each one is equipped with a cushioned, padded grip. These handles are also nice since they come with shock absorption, so no need to fear any hand jarring or knuckle bumping while you’re pruning. Another perk of the Gilmour shears is that these shears are very lightweight. They weigh in at a mighty 1.9 pounds, so you won’t have to worry about tired shoulders and arms after trimming your hedges for a few minutes. Their light weight also makes these shears a good option for someone who is looking for something that is easy to handle and move around. These make for a great budget buy if you’re looking for something that does the basics well without any outstanding features: the blades aren’t crazy sharp and won’t keep an edge like a samurai sword, the handles aren’t able to extend, and there’s no warranty. All in all these are our top recommendation for a budget buy since they do a lot well while still being kind to your wallet. We recommend the Gilmour shears if you’re looking for something dependable that can get the job done without making a big dent in your wallet. These are a great buy for budget shoppers. One of the features we touched on a lot with our hedge shears is weight. It may seem like a little weight is no big deal. What difference does an extra pound make while trimming the hedges, anyways? Well, a good bit of difference. If you would like to do a little experiment to see how heavy a pound can get, take your cell phone and hold it out in front of you with your arms extended and locked – you want a straight line from your shoulder to your hand. Once you have your phone extended, see how long you can hold it like that for. If you’re able to keep your arm extended for over a minute without feeling a little discomfort, congratulations! You are basically superhuman. If you’re like the rest of us and don’t love keeping your arms extended for that long, just know that it’s normal. The bad news of that exercise is that your phone probably weighs less than half a pound. Imagine keeping 2, or 4, or 6 cell phones at full extension for not just minutes, but hours. That’s the difference a lightweight hedge shear can make. You won’t always have your arms at full extension while trimming the bushes, but your shoulders will almost always be engaged and moving. A few pounds doesn’t sound like a big deal, but it can make a big difference in how tired you feel by the end of the day. If you’re confident in your muscle mass or want a pair of shears that will endure through the ages, by all means, go for the heavier pairs. In general, the heavier ones on our list have a higher quality make so they will last you a while longer. If you have a lot of hedges to trim or aren’t confident that you can hold something that will get heavy very fast, then we recommend going for a lighter set of shears for your hedges. Lightweight doesn’t mean low quality, just that the shears are made of a different material than the heavier ones. If you aren’t sure whether heavy or light shears are best for you, we recommend going with a lightweight pair. That pair will be easier to use, more usable for a variety of people, and if you want to go heavier, you can always buy another option. A little pound goes a long way. Depending on the look you’re going for, you might find it handy to purchase more than just a pair of hedge shears. If you’re a perfectionist or someone who has a very specific vision of how you want your front yard to look (you may also find yourself dreaming of being on House Hunters and/or starring in America’s Got Talent for your incredible landscaping skills) then you may want to get hedge shears for the heavy work and something else to take care of the nitty-gritty work that is fine-tuning your hedges. We recommend a good pair of pruning shears. The iGarden set we reviewed above comes with pruning shears but if you want to buy some separately, we recommend Fiskars pruning shears. These have an excellent blade, a good handle for you to grip, and a lifetime warranty is included. If you aren’t too concerned with getting every branch and leaf right, you probably won’t need pruning shears or any other accessories. Do I need an extendable handle? An extendable (or “telescoping”) handle can be useful, but it isn’t for everyone. Telescoping handles will best serve someone who has tall, wide, or deep hedges. These handles can help you take care of fine details up close while still allowing you room to reach the far corners of your shrubbery. If your shrubs have some spots that are hard for you to reach, then telescoping handles may be a good fit for you. It is worth bearing in mind that telescoping handles do add an extra pound or more of weight, so they can be a little bit harder to deal with than their non-extendable cousins. We recommend telescoping handles if you find that it’s always hard to trim the back corners of your shrubs or if you have other hard-to-reach places. Maintenance on hedge shears is low if not nonexistent. The most maintenance you will ever need to do is to sharpen the blades if they become dull. Some blades will dull slower than others and some options, such as the Fiskars, have self-sharpening blades so your maintenance time will be reduced to zilch. Even though you may sometimes need to sharpen your shears, this won’t be a common task. Even the lowest quality shears will last you through many a hedge. Fiskars was founded all the way back in 1649 (and no, that’s not a typo). Fiskars started as an ironworks shop in a Finnish village of the same name. Since then, they have expanded their product line to make it easier for people to do the things they love. Fiskars is well known for its tough products that don’t wear out. Tabor Tools was founded in 1982 and with over decades of experience behind them, now wants to provide people with tools that can work as hard as you do. Their goal is to provide you with high-quality, durable tools that can help you get your yard just how you like it. Tsuneichi Okano began his career as a blacksmith in 1925. Using his knowledge years later, he founded Okatsune to bring his high standards of perfection to the rest of the world. Since its founding, Okatsune has provided high-quality shears and other gardening tools so that you can make your yard look just right. Gilmour began changing peoples’ yards for the better in 1949 when Robert Gilmour created the first pistol-grip water hose nozzle. For Gilmour, every day is about being better and challenging the status quo to make products that are innovative, comfortable, and loved by people who want to own their yard. Gilmour wants to help you make your yard look like you’ve always dreamed it should. Thanks for reading our guide on the best hedge shears! When it comes down to it, the best option for you is going to be the one that suits your unique needs best. Before buying, you’ll want to take a look at the kind of hedges you’ll be trimming. Are they thick, bushy, hard to cut? If so, you may want to go for a shear that can endure the toughest of hedges and is guaranteed to be replaced, or maybe a better option for you is a shear with a telescoping handle so you can get those hard-to-reach corners. You should also take an honest look at your physical condition. Can you handle holding heavy shears out at arm’s length for extended periods of time? If not, you might want to consider a lighter set of hedge shears. Ask yourself another important question: are you going for a polished, well-shaped look or are you just wanting to get the job done? If your desired look is something that could be on BBC Two’s “World’s Most Extraordinary Homes” television show, then it may be best to go for a shear that can snip the branches of your hedges – or make sure that you have a set of pruning shears, as well. Our overall top pick is the Fiskars, but when all is said and done, the best hedge shears for your needs will be the ones that can fit your unique situation. There are some good options here for everyone, so don’t be afraid to be a little picky and take your time looking around at which one is best for you.